Whether you are a university student seeking an undergraduate degree or returning to school for additional schooling mid-career, it is important to consider your borrowing capacity. With the typical cost of attending a public university breaching $25,000, and private schools often costing double that amount, you must balance loans with other forms of financial aid such as scholarships, grants, and cash payments. In 2017 66.7% of high school graduates went to college. In hopes of improving lifetime wages, most will rely on student loans with 70% of graduates borrowing money to fund part of the cost of schooling. In 2017, graduates borrowed an average of $39,400. Despite the rising costs recent studies support the value of education estimating that those with an undergraduate degree will earn over a million dollars more in lifetime earnings than those with only a high school diploma. However, too much debt can cause financial hardship eroding much of the benefit of higher earnings. Rising student loan delinquencies indicate that many students are borrowing above their capacity to repay, raising concerns over the debt level of graduates. Whether you are a university student seeking an undergraduate degree or returning to school for additional schooling mid-career, it is important to consider your borrowing capacity. When you buy a home or a vehicle, the lender decides on how much you can borrow based on your current income, assets, credit and debt levels. Student loans do not have the same checks and balances because repayment relies on future income leaving you to gauge what you can afford to borrow. Rather than focusing on current wages and debt levels, you must estimate future income and make borrowing decisions with a host of unknowns. Before signing the paperwork for your next loan disbursement, consider these factors to keep student loan debt within a range you can afford to repay. With the typical cost of attending a public university breaching $25,000, and private schools often costing double that amount, you must balance loans with other forms of financial aid such as scholarships, grants, and cash payments. Relying heavily on loans will raise debt balances faster. Current students often find it takes up to six years of full-time study to obtain a bachelors degree, adding upward pressure on borrowing more to pay for school. Instead of increasing your loan balance, consider dedicating time each week to identify and apply for scholarships, which can reduce the need for more loans. The price tag for college varies widely. You could spend a few thousand dollars annually at a local community college or over $50,000 for an Ivy League education. The cost of the school has a large impact on borrowing needs. Reduce the need for loans by choosing a lower cost school, or one that provides higher levels of financial aid to offset the higher price tag. Popular ways to lower costs include starting at a community college, attending an in-state public university, working part-time to cover living costs, or living at home. Your area of study is one of the biggest predictors of future income. Evaluate the job market and your future employment prospects before choosing a major. Consider the field of study and qualifications needed to work in your field of choice. What salary will you earn your first year on the job as well as long-term income potential? Experts recommend keeping loan balances below your anticipated first-year salary after graduation. Salary.com lists starting salaries for the most common jobs. Another benchmark you can use is keeping estimated loan payments, under the 10-year repayment plan, at no more than 8% of your expected starting salary. Using this guide, you would only borrow up to $20,000, if you expect to earn $35,000 at graduation. If you borrowed the average of nearly $40,000, you would need to earn a starting salary of $69,000 to remain within 8% of annual income, leaving you with a payment of $460 per month. Using this more conservative guide will leave room for other financial needs and have the debt paid-in-full within ten years. Many jobs require higher education either immediately or down the road. If you intend to get an advanced degree, then the combined loan balances from undergraduate and graduate studies can easily expand beyond the growth in income. It is easier to qualify for free aid for your bachelor’s degree. 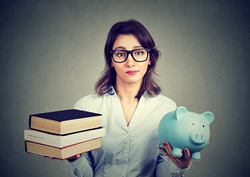 Seeking grants and scholarships for your initial schooling can keep loan balances to a minimum. In many cases, if the career you want requires a higher degree, you can begin at a less expensive school and pay higher rates for the advanced degree saving you thousands of dollars in loans. The traditional repayment plan requires a ten-year payoff schedule. Former students can also choose income-based repayment plans which allows you to extend the payments over a longer time-frame. While this strategy will align the monthly obligation to your income it does not lower the interest rate which could increase the total cost of the loan due higher amounts of accrued interest. If your income rises substantially you could have little left at the end of the repayment period. While it might initially make it easier financially, the long-term impact could affect your spending for two decades or more. 6) Will You Qualify for Loan Forgiveness? Loan forgiveness programs target careers in nursing, education, non-profits and public service. If your career path qualifies you for a loan forgiveness program, you could lower out-of-pocket costs, even if it takes longer to eliminate the debt. It is possible for Congress to add new loan forgiveness programs or adjust existing ones, leaving inherent risk in relying heavily on existing programs to address high debt balances. 7) Are You Borrowing Through Federal or Private Programs? Obtaining Federal student loans for college secures a low rate and a host of valuable benefits. For example, you can wait up to six months after leaving school before beginning repayment. The loans offer generous forbearance and deferment options, and you can borrow money without underwriting. However, the government sets limits on how much you can receive to reduce an over-reliance on loans. When you max out Federal loans, you might consider turning to private loans to bridge the gap. Doing so could be a red flag that you have too much debt to sustain your income after graduation. Finance Solutions is a leading financial services company that provides information about debt relief programs which are designed to help consumers achieve payment relief and reduce debts. Founded in 2007, Finance Solutions works with individuals struggling with debt to explain their options and develop a customized plan. Finance Solutions has helped thousands of consumers reduce their credit card debt through strategies that align with their budgets and goals. More information can be found at https://www.financesolutions.org/.